There are many sources of inspiration at SOAR. One of them is the Spinners’ Gallery. 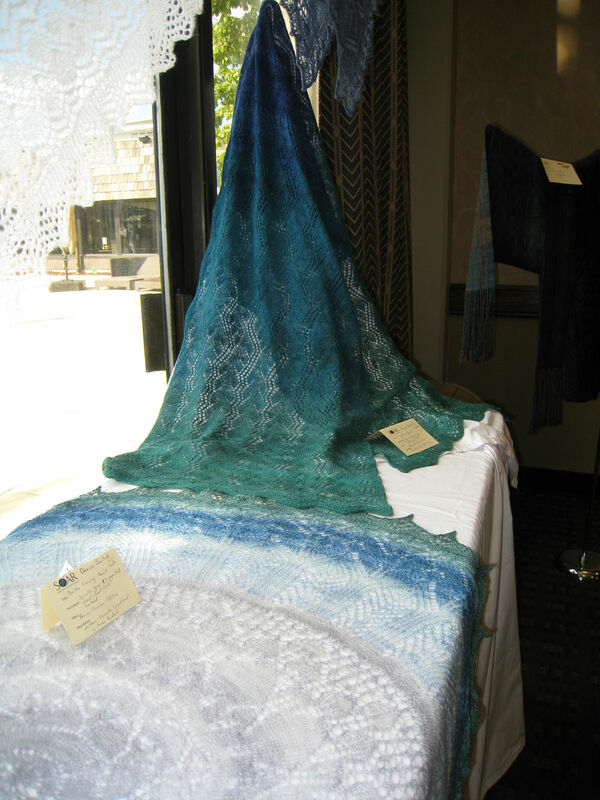 This pair of shawls were spun and knitted by Denise Bartels. These beauties were spun on supported spindles and plied on the spinning wheel. 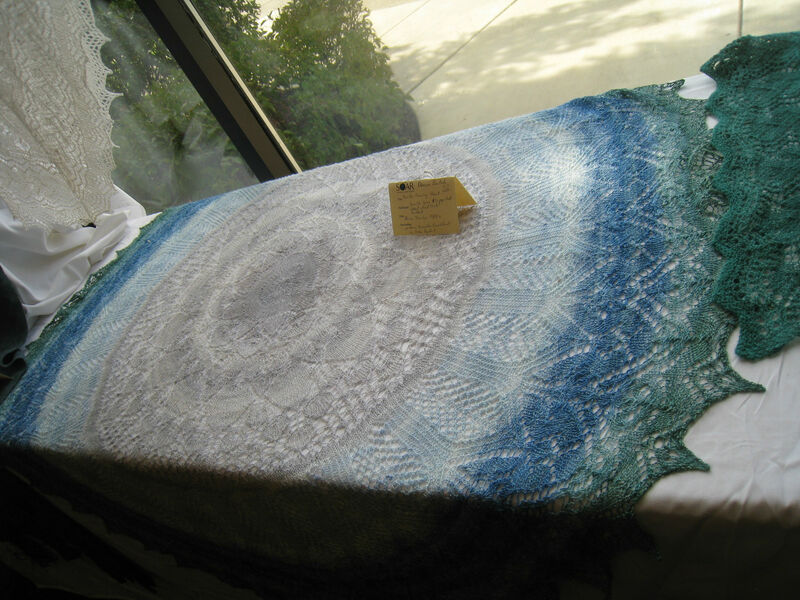 The spinning, the knitting, and the blocking were absolutely perfect. They inspired me to pull out my supported spindle collection and spin on them again. I have never been able to spin more than a few yards here an there (other than cotton on tahklis). I’m not sure why. It just seemed such a slow way to make yarn. But then, 2 years to spin and ply 2 oz of silk isn’t exactly blazingly fast either. It also has never occurred to me to spin wool on supported spindles either. I don’t know why but I only associate short fibers with supported spinning. Once I returned home, I pulled out my supported spindle collection. I only have 3 in my collection so I took them out for a test drive. One of them has some cashmere that I started at SOAR in 2012. I didn’t get very far with them. I spun a bit, and it was a bit of a slog. 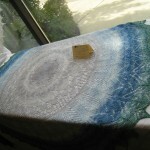 I pulled out another spindle and a small bit of merino/silk that was leftover from another project. This went much better, especially once I pre-drafted the heck out of it before spinning over the fold. But the spindle shaft was too fat at the tip. I will need to sand it down. Then I went to the 3rd supported spindle I have. 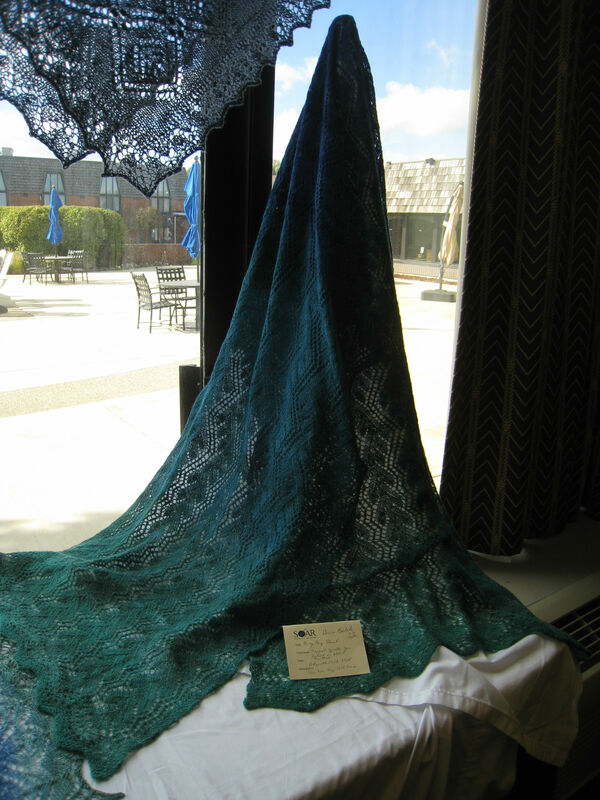 It is one of a pair that I purchased years ago at another SOAR. One is maple (cashmere project) and one is walnut. Both gorgeous, but heavy. Really heavy. Feeling a bit like Goldilocks, I looked around and found the stone bead supported spindle I made years ago and a bit of sample fluff from Corgi Hill Farm, I sat down to spin. I think I’m finally getting it! It will be a while before I gain proficiency, but it’s definitely looking like lace weight yarn! Will this take over as my preferred spinning method? No. 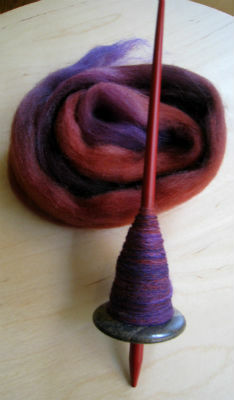 I doubt it, but it is nice to have this successfully in my spinning repertoire.